A charming and heart-warming story from Giles Andreae, creator of Purple Ronnie and Edward Monkton. The Knitting Gorilla After six beautiful daughters, the Big Gorilla finally had a SON. "You will grow up to be BIG and FIERCE, just like your daddy!" he said proudly. But the Little Gorilla grew up to be ...small ...and gentle ...and not like his daddy at all. And what he liked doing most ...was KNITTING. And so begins a story about BEING YOURSELF - a joyous little treasure for the whole family to share. World of Happy ...because life is FUN! Giles Andreae's World of Happy series is more joyful and anarchic than anything you have ever read before. 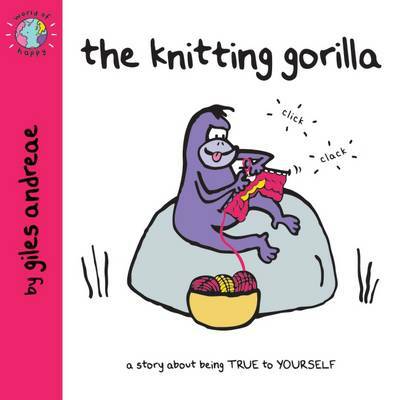 The Knitting Gorilla contains the same playful, quirky sense of humour that made Purple Ronnie and Edward Monkton global brands.